Wow this review is quite late. I have a backlog of about six books that I need to review. Ooops. Anyhoos, I didn’t want to skip my review of The Graveyard Book since I thoroughly enjoyed this fantasy novel. Last month, I participated in a group read of the novel. The review below is spoiler free. Some of you may have heard “It takes a village to raise a child.” Gaiman changes this notion a tad. Instead of a village, he writes of a graveyard raising a child. Nobody “Bod” Owens is alive and he’s lucky to be alive. The man Jack killed his entire family. During the attack, Bod is a toddler who wanders off and ends up in a graveyard. Mr. and Mrs. Owens, two ghosts, discover the child and decide to raise him with the help of Silas, who is not of the living or dead. However, the man Jack hasn’t completed his mission. He was sent to kill Bod and he intends to finish the job. Can Bod survive growing up in a graveyard and the man Jack? Gaiman came up with this idea during a visit to a graveyard with his son. As he watched his son ride a bike through the cemetery he realized his son looked at ease playing in the cemetery. He started to consider writing a story like The Jungle Book set in a graveyard. However, he felt he wasn’t ready to write this story yet. He wanted to hone his craft first. Turns out he made a wise choice. This novel, published in 2008, won the British Carnegie Medal and the American Newbery Medal. This was the first time one work received both of these awards. In addition, he won the Hugo Award for Best Novel and the Locus Award for Best Young Adult Book. If you are in the mood for some ghostly fun I highly recommend this novel. Not only was it a delightful read, but the character Bod won a place in my heart. If Gaiman continued Bod’s story I would be one of the first in line to purchase it. This novel fits in with my Award Winning Books challenge. This entry was posted in Books and tagged 50 Year Project, Award Winning Books, Blog, Blogging, Books, Carnegie Medal, Cemeteries, Fantasy, Ghost Stories, Graveyards, Hugo Award, Literature, Locus Award, Neil Gaiman, Newbery Medal, The Graveyard Book, The Jungle Book, Young Adult Fiction. Bookmark the permalink. Sounds like you enjoyed this clever read. But saying you would be first in line for the sequel tells us all we need to know. Will add this one to the ever growing list I keep. Interesting backstory. Thanks for sharing. I’m glad you enjoyed this book. It is one of my favorites by one of my favorite authors. I can only agree, it is well worth reading and I hope it will be turned into a movie. I woud love to see it. I think they are making a movie, don’t know when it will be made or released though. I hope it turns out just as good. I read this a few years ago, and LOVED it. I suggested it to my Mom, even though this isn’t her kind of book at all, and she ended up recommending it to a ton of her friends. 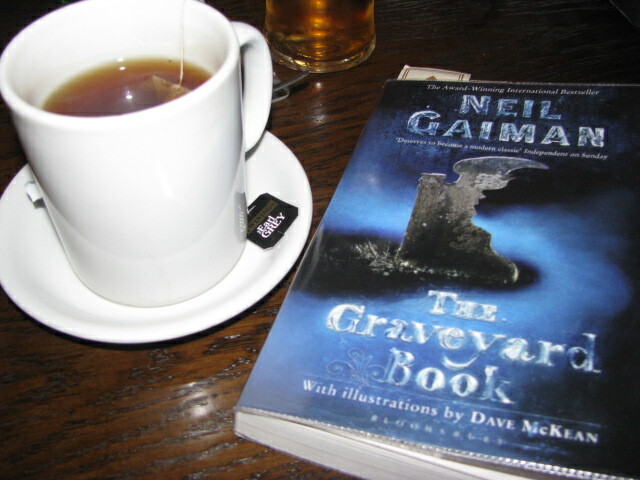 I really hadn’t heard of Gaiman until Carl introduced me to his works. Now I keep recommending him to everyone–and I’ve only read Neverwhere and this one. I need to get the other books. Bod definitely won a place in my heart too :). I really enjoyed this book! Quite interesting! Thanks for sharing. Great review! It was also my first Gaiman book, and I agree I want to read more by this author.